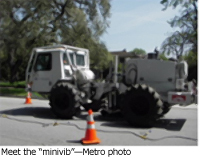 Planning for the extension of the subway to Westwood takes a small step forward next week when that truck at the right — the minivb — will begin seismic testing for the subway project. The subway extension is set to receive more than $4 billion from the Measure R sales tax approved by voters in 2008 and Metro officials are currently seeking federal funds to supplement the local money. Under Metro’s long-range plan, adopted by the Board of Directors in October, the first phase of the subway extension to Fairfax Avenue would open in 2019. For four evenings beginning Monday night, January 12, 2010, our contractors will be performing field seismic investigations in the Century City/Westwood area as a part of the ongoing Draft Environmental Impact Statement/Environmental Impact Report (EIS/EIR) for the Westside Subway Extension. Data gathered from these investigations is part of the necessary environmental work to identify the best locations of subway tunnels and stations in the area.This work must be conducted at night to minimize interference from traffic vibrations and reduce potential traffic disruptions along heavily traveled Santa Monica Boulevard. Any disturbance experienced by area residents should be minimal and for a very brief duration. Project staff has had extensive contact with homeowner association leaders and other key stakeholders in the area to provide an overview of the work and respond to numerous questions seeking technical clarification of the activity and how the data will be used. This past Tuesday, approximately 240 letters were sent via US Mail to all addresses located directly where the work will occur. A construction notice (attached) along with copies of the letter has been distributed electronically to the homeowner associations, Westfield Century City mall, and other key stakeholders for their wider distribution. Follow-up seismic evaluations that are more focused are anticipated and will be determined based on the results of this work. Later this month, we will provide an update on the Westside Subway Extension Draft EIS/EIR at the Planning & Programming and Measure R Committees. The Draft EIS/EIR should be released for public review and public hearings this summer before returning to the Board later in the year for consideration of selecting the Locally Preferred Alternative. There are also a few more details along with a photo of the truck that will be doing the work on the website of County Supervisor Zev Yaroslavsky, who is also a member of the Metro Board of Directors.